I don't doubt that Microsoft's intellectual property and licensing group is managing these deals proactively and creatively -- we'll get to that in a moment. But it's not just about proactive and creative management. It's also the strength of the IP that a company brings to the table. If you have strong patents and manage them well, you will do well. If you don't have a strong portfolio and then make management mistakes, which Google clearly made in connection with the Motorola deal that was a huge waste of money with respect to the patents involved and only got it into antitrust trouble, then your problem gets worse. The philosophies of Microsoft and Google with respect to intellectual property -- and, as part of that, litigation avoidance -- couldn't be further apart. The whole idea of the Google-Motorola deal was to buy patents in order to sue others over them, hoping that this would bring about a stalemate -- a strategy that has been an utter failure. Compare this to Microsoft's focus on licensing patents in order to avoid litigation from being brought in the first place. It's easy to see that Google's Motorola strategy has failed. There are only two ways in which you can get leverage out of a patent portfolio. The most important one by far and away is to obtain injunctions. Motorola has won zero enforceable injunctions against Microsoft and it just lost the only injunction it has been enforcing recently against Apple, which a German appeals court confirmed to me (will discuss this one in my next post). The alternative approach to get leverage out of patents is to seek monetary compensation, and a U.S. district court awarded Motorola less than one-twentieth of a percent of the royalty rate it initially demanded from Microsoft (a German court has also indicated it won't bless Motorola's royalty demand from Apple). 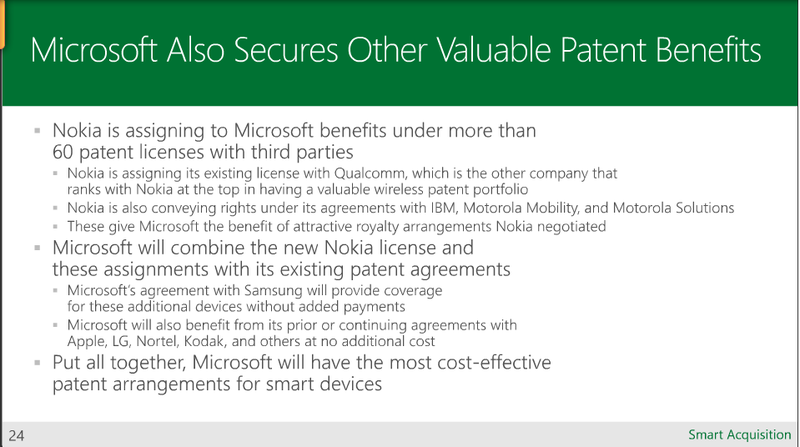 The slide from Microsoft's rationale document that I published further above gives an example of one of the mistakes that led Google to totally overpay for Motorola's patents: it didn't take into consideration that a broadly-licensed patent portfolio is less valuable than one you can still assert against pretty much everyone in a given industry. Microsoft says that "Nokia is also conveying rights under its agreements with IBM, Motorola Mobility, and Motorola Solutions". This means that a Motorola-Nokia license deal struck a few years ago apparently goes with Nokia's wireless devices business. As a result, Google's Motorola can't sue Microsoft's future smartphone business for the remaining term of that agreement, and Motorola's patent portfolio gets less valuable by the day. License agreements are typically not published, and litigation is often the only way to find out about any of their terms. I don't know the specific terms that will enable Microsoft to benefit from those Nokia deals with IBM, Motorola Mobility, and Motorola Solutions. But my best guess is that those license agreements were phrased in a way that would make the license travel with the licensed business unit and products. That's not unusual. But there are deals that don't come with the related provisions. The mentioning of IBM is interesting not because IBM would be likely to sue Microsoft directly (I don't think that would ever happen) but because IBM has repeatedly sold patents to Google. 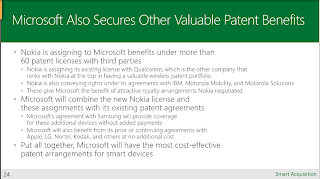 IBM, Motorola Mobility and Motorola Solutions are only three examples of the "more than 60 patent licenses with third parties", claimed to come with "attractive royalty arrangements", from which Microsoft will benefit. Microsoft will also be assigned Nokia's "existing license with Qualcomm". Without these additional benefits to Microsoft, it would have had to work out a number of wireless patent license deals as a result of the Nokia deal. Now it appears that the relevant mobile devices will have a comfortable licensing position to start from because Nokia assigns benefits under five dozen deals to Microsoft. "Microsoft will also benefit from its prior or continuing agreements with Apple, LG, Nortel, Kodak, and others at no additional cost"
Little is known about the Microsoft-Apple deal, but it was discussed, privately for the most part,in at least one of Apple's litigations. LG took a royalty-bearing Android patent license from Microsoft in January 2012 (and also had another patent license deal in place before that one). Nortel's patents were acquired by a consortium that inclucded Microsoft, and indirectly Microsoft was also involved with a recent deal relating to Eastman Kodak's digital imaging patents. "Put all together, Microsoft will have the most cost-effective patent arrangements for smart devices"
This may prove a far more important competitive advantage than many people think today. It will enable Microsoft, after this deal closes, to deliver smartphone functionality at attractive prices while maintaining a reasonable level of profitability. Companies that own weaker portfolios (because they contributed less to innovation and didn't do the smartest acquisitions and license deals) will find themselves at a disadvantage, unless they have something to offer that enough customers are willing to pay a premium for.